Postcards are an inexpensive way to reach your audience. These targeted marketing pieces can quickly convey key messages and offerings. Direct mail and postcards have been simple and effective for decades. Trust our staff of experts to create a custom postcard (available in all shapes and sizes) for your business or organization. We can even handle the mailing. Trenton Printing has an in-house full service lettershop. 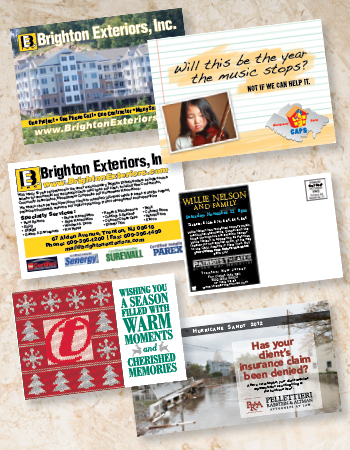 Ask us about Every Door Direct Mail® - EDDM. We specialize in: Business Postcards, Custom Postcards, Every Door Direct Mail® (EDDM) Postcards, Invitation Postcards, Political Postcards, Promotional Postcards and more! Want to take your mailing to the next level? Consider including an attention-getting promotional product with the postcard you send to customers and prospects.